Nearly 10,000 new homes are coming to Hernando County as the area prepares for the population to start growing more than it has in a decade. 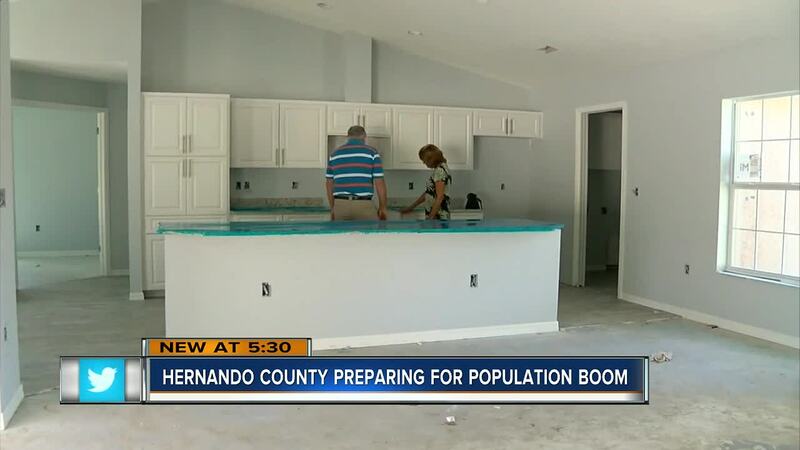 HERNANDO COUNTY, Fla. — Nearly 10,000 new homes are coming to Hernando County as the area prepares for the population to start growing more than it has in a decade. "I’m looking forward to being in the pool," said Gary Ross. After living nearly their entire lives in Buffalo, New York, Gary and Linda Ross looked all over Florida for a place to retire. "We drove to both sides of the state figuring out where we were going to live. We did that for about a month, driving back and forth, and we settled on this area mainly because of the affordability of the houses here," said Ross. In the last few years, the economy has picked up with thousands of people moving to the Hernando County each year, and those numbers are expected to accelerate. Officials say the appeal is it’s only a 45 minute commute to Tampa but still rural enough to be very affordable. "We are part of Tampa Bay but we’re sort of like the frontier," said Leonard Sossamon, Hernando County Administrator. According to Zillow the median price for a home in Hernando County is $165,000, compared to $219,000 in Hillsborough County, $54,000 difference. "We’re getting a mixture of everything from people that are moving from the frozen tundra up north to younger couples moving in," said Sossamon. That’s why permits for nearly 10,000 homes have been approved, new housing subdivisions are being built, and why the county says they’re focusing on updating infrastructure, in preparation for rapid growth.